In general, a wireless local area network (WLAN) refers to a wireless computer network. More commonly, WLAN is equated with the implementation specified by the IEEE® 802.11™  group of standards and branded as Wi-Fi® by the Wi-Fi Alliance. The Wi-Fi Alliance certifies interoperability between IEEE 802.11 devices from different manufacturers. WLAN Toolbox™ functionality enables you to model IEEE 802.11 standardized implementations of the WLAN physical layer (PHY). It also enables you to explore variations on implementations for future evolution of the standard. IEEE 802.11 defines the network architectures. In IEEE 802.11, a group of stations (STAs) within a defined coverage area and with appropriate association to each other form a basic service set (BSS). The BSS is a basic building block for 802.11 network architecture. A basic service area (BSA) defines an area containing STAs within a BSS. STAs can be associated in overlapping BSSs. In terms of mobility, STAs are either fixed, portable, or mobile. Any compliant STA can serve as an access point (AP). The figure depicts WLAN components and network architectures built up from BSSs. Independent BSS (IBSS) describes STAs communicating directly with one another in an ad-hoc fashion. An IBSS has no connection to the wired network. Infrastructure BSS describes STAs associated with a central STA that manages the BSS. The central STA is referred to as an access point (AP). This deployment is commonly used in home, office, and hotspot network installations. Generally speaking, the AP connects wirelessly with associated STAs and is wired to the Internet. This connection enables associated STAs to communicate beyond the local BSS. The APs also wirelessly serve STAs in a BSA, providing internet connectivity for those STAs. 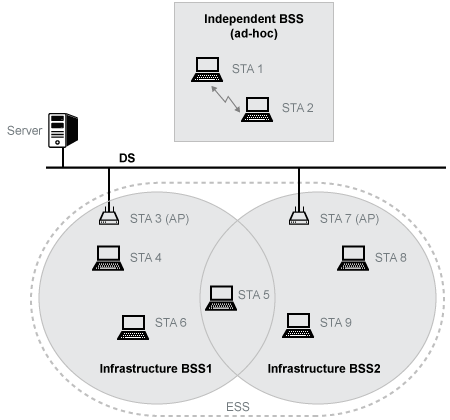 Distributed systems (DS) interconnect infrastructure BSSs via their APs. Typically the DS backbone is an 802.3 Ethernet LAN. Extended service set (ESS) describes a set of infrastructure BSSs interconnected by a DS. In an ESS, APs communicate among themselves to forward traffic from one BSS to another and to facilitate the movement of mobile station from one BSS to another. The interworking reference model shown here includes a subset of the network components associated with the data link layer (DLL) and physical layer (PHY). IEEE Std 802.11-2012 , Section 4.9.2 describes the interworking reference model for 802.11. the medium access control (MAC) is a sublayer of the DLL. The 802.11 standards focus on the MAC and PHY as a whole. The WLAN Toolbox PHY modeling functionality focuses on the physical medium dependent (PMD) and the physical layer convergence procedure (PLCP) sublayers of the PHY, and their interfaces. Data and control information messages are exchanged between layers of the protocol stack within an individual STA and between peer layers in communicating STAs. Data and control information exchanged between peer STA layers are protocol information transfers. See MPDU and PPDU in the figure. Data and control information exchanged between layers within an STA are service information transfers. See MSDU and PSDU in the figure. 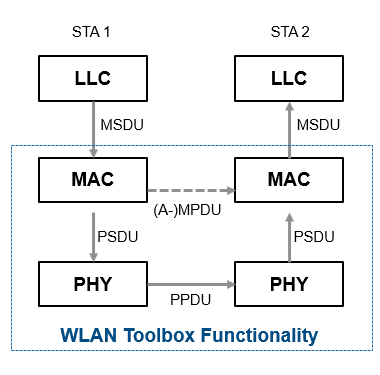 WLAN Toolbox functionality focuses on PHY implementations and the exchange of PPDUs between PHY peers. Messages exchanged between protocol stack layers are briefly described here. For more information on these messages, see IEEE Std 802.11-2012 . This figure shows the distinction between these WLAN message data units for a nonaggregated MAC frame. In reference to PSDU, the terms PLCP SDU and PHY SDU appear in the 802.11 standard. PLCP is the physical layer convergence procedure sublayer of the PHY. No distinction is made when the terms are used between layers. The IEEE 802.11 standardized implementation of WLAN has evolved since its first release in 1997. Today, it is deployed worldwide in unlicensed regions of the radio frequency spectrum. Since the first release, the 802.11 standard has progressed to include several physical layer implementations and has ensured backward compatibility with legacy releases. Over time, the maximum achievable transmission data rate has grown from 1 Mbps to nearly 7 Gbps. WLAN Toolbox provides native support for the various 802.11 standard versions listed here. The toolbox focuses on the physical layer and enables adaptation of standards-based functionality to explore custom implementations. Deployment and commercial uptake grew with the increased data rates offered by 802.11b direct sequence spread spectrum (DSSS) with complementary code keying (CCK). At that time, companies began offering 802.11b products and systems for WLAN. The 802.11a amendment increased data rates by introducing an orthogonal frequency division multiplexing (OFDM) physical layer. However, OFDM was deployed at only 5 GHz, so uptake was slow. A short time later, the FCC allowed the use of OFDM at 2.4 GHz. The adoption of the 802.11g amendment offered the opportunity to operate the PHY defined by 802.11a at 2.4 GHz, with backward compatibility to the 802.11b PHY. With 802.11n, a data rate increase came by way of widened channel bandwidth and allowance of up to four input/output streams. For 802.11ac, wider channels and up to eight input/output streams offers higher maximum throughputs. This increased throughput capability enables users to stream video to mobile devices in the home or at public mobile hot spots. The 802.11ad amendment specifies operation in the 2.4, 5 and 60 GHz bands. The 802.11ah amendment uses sub 1 GHz frequencies (unlicensed 900 MHz bands) to provide extended range, and has low energy consumption to support the concepts involving the Internet of Things (IoT). The 802.11ax amendment introduces OFDMA to improve overall spectral efficiency, and higher order 1024 QAM modulation support for increased throughput. The demand for bandwidth continues to grow and the IEEE 802.11 working groups continue to advance standards to raise the throughput ceiling. For the history of IEEE 802.11 and to monitor working group activities, consult the IEEE website . IEEE Std 802.11ah™-2016 IEEE Standard for Information technology — Telecommunications and information exchange between systems — Local and metropolitan area networks — Specific requirements — Part 11: Wireless LAN Medium Access Control (MAC) and Physical Layer (PHY) Specifications — Amendment 2: Sub 1 GHz License Exempt Operation. IEEE Std 802.11-2012 Adapted and reprinted with permission from IEEE. Copyright IEEE 2012. All rights reserved.